Bushiroad Inc. has begun distributing tournament organization software, to assist organizers in creating fair matchups for both singles and triples tournaments. This seems to be a move geared toward greater transparency, as by distributing their software to the public, Bushiroad is also assuring cardfighters of the fairness of the tournaments. 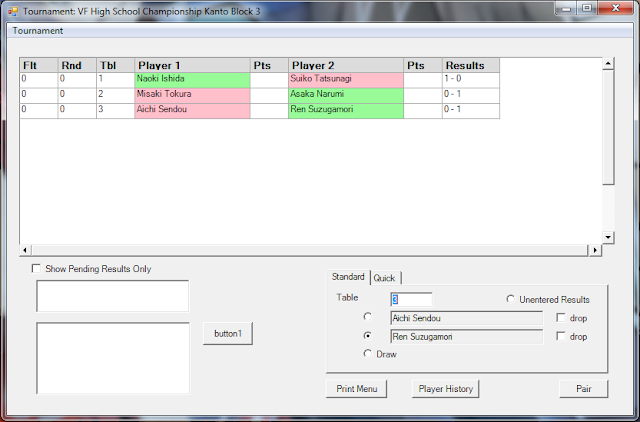 The software has options for Swiss, Single Elimination and Double Elimination Swiss Pairings. Interestingly, this press release is the second official mention of the anticipated WCS2013 event. As the current Challenge Cup and Team League are now in the process of progressing past the initial elimination stage, and their finals will be held in June and July, public interest in the next World Championship is building. A user manual for the software can be downloaded at http://cf-vanguard.com/en/wp/wp-content/uploads/Bushiroad-Tournament-Software-Manual.pdf. The World Championship 2013 focuses on individual players and will be held in the latter half of 2013."